The Nebraska Residential lease Agreement Template is a Standard lease agreement lasting for a one year term though it can be modified for a shorter or longer term as per the lessor or the lessee. There are numerous details that need to be filled in this agreement like; the date and the agreement, the names of the landlord and the tenant, the location of the premises, the term in number of months or years of this Nebraska Residential Lease Agreement. The rent in US dollars that the tenant will have to pay to the landlord on the specified day every month. The amount of damage deposit that the tenant will pay to the landlord. The number of people who will be occupying the residence and that names, the number of animals (if any) that the tenant is allowed to keep and the amount that the tenant shall pay to the landlord as per deposit. The predetermined amount of late fees/live charges in dollars, the addresses of the landlord and the tenant in case any notice has to be served on either of them. No hazardous materials, that either the flammable or explosive or considered dangerous the insurance companies, will be kept in the premises. If the tenant continues to live at the premises with the consent of the landlord even after this agreement has expired than a new month to month tenancy agreement will be created between the landlord and the tenant. When the agreement expires the tenant will surrender the premises to the landlord as good condition as it was when at the commencement of this agreement. If any of the rules and regulations of this agreement are not complied with by the tenant than the landlord has the rights to serve seven days notice to the tenant and take legal action against the tenant. The remainder of this agreement contains the terms and conditions about the governing law, severability, non-waiver, modification in this agreement and any other additional provisions or disclosures. 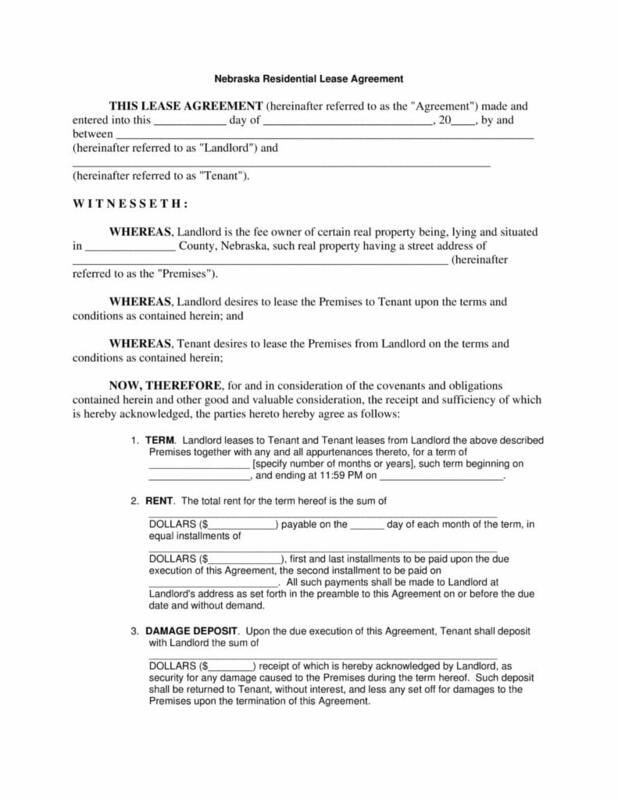 The landlord and the tenant both need to sign this agreement when it is being executed. Download this Nebraska Residential Lease Agreement Template by clicking on the download link below.